Oh, the dilemma of home-entertaining in our hectic world! Sure, formal sit-down dinners may impress our friends, but the hours spent slaving in the kitchen leave us exhausted. And it doesn't seem quite so hospitable to ask guests to throw together a casserole for a potluck supper. What's the alternative to this common predicament? 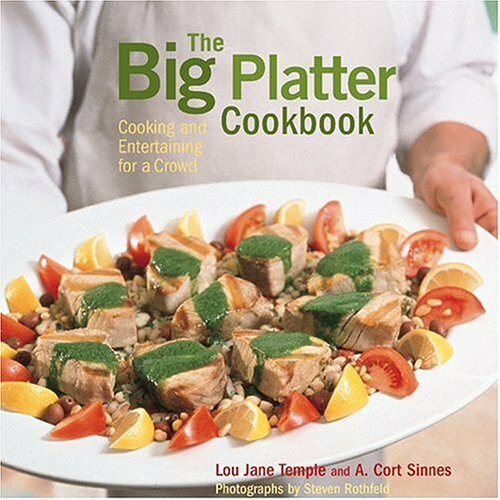 In The Big Platter Cookbook, seasoned hosts and food writers Lou Jane Temple and A. Cort Sinnes serve up more than 100 full-flavored, crowd-pleasing, incredibly convenient recipes-like Cowboy Cassoulet, Bourbon and Coke Short Ribs, and Butternut Squash Risotto-that reflect the comfortable, casual approach to entertaining we prefer today. This cookbook is organized by the seasons, and includes chapters on starters and desserts to round out the meal. Each entree is paired with a recommended wine, and the book closes with suggestions for pots and pans that will make preparing these dishes a breeze. LOU JANE TEMPLE, the former owner of Cafe Lulu in Kansas City, continues to develop menus for new restaurants. She writes about food and entertaining forKansas City Magazine, and is the author of the Heaven Lee Mysteries, a series of culinary thrillers. A. CORT SINNES is the author of three popular cookbooks on grilling, including The Grilling Encyclopedia, which was nominated for a James Beard Award, and The Gas Grill Gourmet, which has sold more than 150,000 copies. He lives in Napa Valley. STEVEN ROTHFELD's photographs have appeared in numerous magazines and books.